High-heeled shoes increase the difficulty of maintaining balance. The aim of this study was to evaluate the dynamic posture control when wearing high-heeled shoes using star excursion balance test (SEBT) in combination of plantar pressure measurement. 20 healthy young females volunteered to participate in the test. Participants completed the modified three directions including anterior, posteromedial, and posterolateral in the SEBT. Three different types of shoes were used: Flat (0.8 cm), Low (4.0 cm), High (6.6 cm). A Novel Pedar insole system was used to measure peak pressure, contact area and pressure-time integral of the stance limb. Results showed that normalized excursion distance decreased significantly as heel height increased. The changes of plantar pressure in the SEBT as heel height increased were more obvious in MF, MM, MR and ML areas. Plantar loading of stance limb shifted to medial forefoot to reduce posture instability. Knowledge of this study identified dynamic posture control deficits when wearing high-heeled shoes and the critical role of medial forefoot in posture control, providing a basis for further research of improving the ability of dynamic balance. High-heeled shoe has been a popular footwear accessory for nearly 300 years and are used on a daily basis for 39% to 69% of female (Linder & Saltzman 1998). It has demonstrated that high-heeled shoes could cause potential dangers, such as abnormal plantar pressure distribution, leading to plantar forefoot pain, hallux valgus, and metatarsalgia (Dawson et al. 2002; Cong et al. 2011). Impairing body balance and postural control may also be induced by high-heeled shoes (Hapsari & Xiong 2016; Menant et al. 2008). Loss of balance has been verified as a risk factor of falling and lower limb injury (Plisky et al. 2006; Winter 1995). With narrow and unstable supporting, high heels increase the challenge of posture control. Gerber et al. (2012) found the change in ankle position due to wearing high heels increased the oscillation of the centre of pressure, which is a surrogate index measured to quantify static postural stability (Caballero et al. 2015). However, there is limited available evidence regarding postural stability during dynamic tasks while wearing high heels. The integration of sagittal, frontal and transverse movements of lower limb joints together with the comprehensive neuromuscular control features SEBT different from other commonly utilised static measures of postural control. The Star Excursion Balance Test (SEBT) is a valid and sensitive assessment of dynamic balance (Gribble et al. 2012). It requires individuals to manage to establish a stable base of support on a series of single-limb squats in the middle of the testing grid with the non-stance limb reaching maximally to touch a point along 1 of 8 prescribed directions (Gribble 2003). Recently, Hertel et al. reported that there was great functional redundancy across the 8 reach directions and recommended that only 3 reach directions (anterior, posteromedial, and posterolateral) should be performed in the test (Hertel et al. 2006). The reach distance is used as an index of dynamic postural control. Farther distance indicates better dynamic postural control; conversely, closer reach distance indicates a deficiency in dynamic postural control. Filipa et al. 2010 noted improved dynamic postural control of young female athletes after 8 weeks of neuromuscular control training in the case of improvement in the SEBT composite score of 1.75% to 9.5% in anterior, posteromedial and posterolateral directions. High heels force the foot into plantar flexion position resulting in foot arch rising and disturbance of the articular congruence between the talus and tibiofibular mortice, all of which may lead to posture instability during movements and could be reflected on changes of plantar pressure distribution. Measurement of plantar pressure of the stance limb during completion of SEBT may help better understanding the potential source of improved or reduced reaching excursions in the SEBT. The purpose of this study was to assess ability of dynamic posture control when wearing high-heeled shoes using SEBT in combination of plantar pressure measurement. 20 young healthy females volunteered to participate in the study. All participants wear high-heeled shoes regularly for more than two years (more than four times a week) and had no foot deformity or lower limb injury in the last six months. This was the first time for all participants to take part in the SEBT. This study was approved by the Ethics Committee of Ningbo University. Demographic information of participants is listed in Table 1. Note: Leg length was measured from the anterior superior iliac spine to the medial malleolus. Shoes with three different heel heights were used: flat (0.8 cm), low (4.0 cm), high (6.6 cm) (Figure 1). A Novel Pedar System (Novel, GmBH, Munich, Germany) was used to collect plantar pressure data. The plantar surface was divided into seven masked regions according to human anatomy and labelled as big toe (BT), other toes (OT), medial forefoot (MF), lateral forefoot (LF), medial midfoot (MM), lateral midfoot (LM), medial rearfoot (MR) and lateral rearfoot (LR; Figure 1). Plantar pressure parameters include peak pressure, contact area and pressure-time integral. Data of peak pressure and contact area at the moment of the right leg touching the ground were extracted for analysis. Data of pressure-time integral during the entire motion (the period from initiation of reaching to totally pulling back) was used for analysis. Shoes used in the test (left) and sub-divided plantar areas of the stance limb (right). Leg length was measured as the distance from the stance-leg anterior superior iliac spine to the medial malleolus, and all excursion distances were normalized to leg length as a percentage of this measurement. Participants were then instructed to stand on their dominant limb with the heel in the middle of the testing grid and the front edge of the shoe aligning with the anterior line. The grid consisted of 3 lines extending out at 120° from each other (Figure 2). The non-stance limb reached as far as possible in the anterior, posteromedial, and posterolateral lines, lightly touched the line with the most distal portion of the reaching leg without shifting weight to or resting on this leg, and returned the reaching leg to the beginning position in the middle of the grid (Figure 2). The subjects were asked to place their hands on their hips and not allowed to lift the stance heel off the ground during the test. Any deviation from these instructions was considered a failed trial. The subjects repeated the trials for each pair of the shoes. The shoes and testing directions were randomized to prevent order effects. Three successful repetitions were performed in each direction. A minimum of 30s was allowed between trials to avoid fatigue. Prior to testing each subject practiced the trials around the grid four times and next had a five minute recovery before the formal testing (Robinson & Gribble 2008). Reach directions in the SEBT. Statistical analysis was performed using STATA 12.0 software. One-way repeated-measures ANOVA were used to identify the significant differences in normalized excursion distances. One-way ANOVA with post-hoc Bonferroni correction was used to identify the significant differences in variables of peak pressure, contact area and pressure-time integral. The differences were considered to be statistically significant when p <.05. From Figure 3, it is obvious that the normalized excursion distances in the SEBT decreased as heel height increased for three reaching directions. Statistical results showed that difference in the normalized excursion distances in all directions were significant (Table 2). Comparison of normalized excursion distance (%) in the SEBT between different shoes. Normalized excursion distance (%) in anterior, posterolateral and posteromedial directions in the SEBT, Mean (SD). Figure 4 shows the visualizing network of significant differences in peak pressure, contact area and pressure-time integration between different shoes. Each connecting line represents that there is a significant difference between the two shoes regardless of reaching direction. There were intensive heel height effects on MF, MM, MR and LR areas. Figure 5 shows the statistical results of peak pressure, contact area and pressure-time integration on each sub-divided area between different shoes. In MF, peak pressure and pressure-time integral of Low and High increased significantly compared with Flat, while contact area decreased significantly as heel height increased. In MM, peak pressure, contact area and pressure-time integral of High and Low were significantly lower than Flat. In MR and LR, three variables of Low and High decreased significantly in comparison with Flat except for contact area of MR in the posterolateral direction. Visualizing network of significant differences in peak pressure, contact area and pressure-time integration between different shoes. Comparison of peak pressure, contact area and pressure-time integral in three reaching directions between different shoes. Note: #, * and & indicate significant difference, p <.05 (* for comparison between Flat and Low, # for comparison between Flat and High; & for comparison between Low and High). Women who wear high-heeled shoes situate in a condition of high risk of falling due to the reduced balance control ability. This study evaluated the dynamic balance control while wearing high-heeled shoes using SEBT in combination with plantar pressure measurement. Results from SEBT reinforce the previous statement that high-heeled shoes could undermine dynamic posture control. Similarly, Sun et al. (2016) noted that wearing high heels increased the difficulty to control the centre of gravity and caused less tolerance in coping with sudden perturbations. SEBT has been commonly used to measure dynamic balance as a reliable diagnostic tool (Gribble et al. 2012). The decreased excursion distances in anterior, posterolateral and posteromedial directions in SEBT demonstrated reduced dynamic balance when wearing high-heeled shoes compared with flat shoes. This is consistent with the outcome from Menant et al. (2008) Chien et al. (2013) also observed that young adults adopted a conservative strategy in order to improve balance control during narrow-heeled gait. In addition to forcing the ankle to a plantar-flexed state, high-heel shoes with narrow supporting base increase the demands on muscle strength of the stance limb when performing in the SEBT. This potentially explains the reduced excursion distance in three directions while wearing high-heeled shoes. As high height grows from Low to High, decreased excursion distance in the anterior direction is less obvious than in the posterior directions. Maintaining dynamic balance is a complex task controlled by the central nervous system integrating visual, vestibular, and somatosensory systems (Hlavacka et al. 1996). During the anterior reach trials, subjects are able to visualize the moving limb throughout the activity, thus, the visual system may assist in reaching performance. By contrast, the limb moved behind the body out of the line of sight during the posterior trials, which reduces the effect of the visual system leading to diminished posture control (Mergner et al. 2005). The posterolateral direction seems to be the most challenging trials as high height grows from Low to High in consideration of the more limited excursion distance in this direction. To maintain balance, the body centre of gravity should remain within the base of support. However, the centre of gravity shifts farther from the stance limb during posterolateral trials possibly developing the poor dynamic balance. This study initially used Cytoscape to display the significant differences in plantar pressure features between different shoes. Cytoscape has been widely used in biology field to show the relationships between different genes through building a functional interaction network (Pahl et al. 2012; Laczny et al. 2012; Wang & Yu 2013) From the visualisation network, it is suitable and effective for a quick inspection of all relationships. The visualizing network in this study clearly illustrates that the effects of heel height on peak pressure, contact area and pressure-time integration are more obvious in MF, MM, MR and ML areas in the SEBT. Furthermore, differences are more obvious when comprison were made between High and Flat or Low and Flat shoes. However, obvious differences in plantar loading between High and Low shoes only exist in MF area. Statistical data from plantar pressure measurement showed that contact area presented a generally decreased trend on sub-divided areas as heel height increased indicating a reduced body balance. This is in line with the results of decreased reaching distance in the SEBT. Due to the elevated heel, contact area in toes showed significant increase with the increasing of heel height. The decreased plantar loading in MM may be associated with the foot morphological changes such as arch rising while wearing high-heeled shoes, which is a potential factor causing posture control deficit. A finite element model has demonstrated that the strain on plantar fascia decreased with heel lifted compared to the flat horizontal support (Yu et al. 2008). Plantar loading in the heel also showed to be decreased as heel height increased, which may affect ankle stability in maintaining balance. Gribble et al. (2004) observed decreased performance of the chronic ankle instability subjects on the injured sides in anterior, medial, and posterior reaching directions in SEBT. Different from changes in the midfoot and the heel, the increased peak pressure in toes may be associated with its prehensile function which is forced to strengthen to tackle the unstable base due to high heels (Lambrinudi 1932). However, when heel height increased to High, plantar loading shift to forefoot area resulting in decreased peak pressure in toes and increased peak pressure in MF. It is speculated that toes prehensile function could be impaired the heel grows a certain height; in this case, MF area strengthens its role in reducing posture instability. 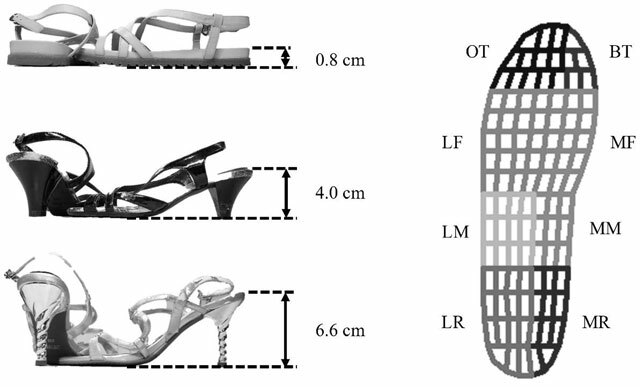 This study evaluated the effect high-heeled shoes on dynamic balance by combining SEBT and plantar pressure measurement. Performance in the SEBT decreased as heel height increased with less excursion distance in anterior, posterolateral and posteromedial directions. The changes of plantar pressure in the SEBT as heel height increased were more obvious in MF, MM, MR and ML areas. To maximise body balance, plantar loading of stance limb shifted to medial forefoot. As heel height increased from Low to High, poterolateral direction created greater challenge due to the farther shifting of centre of gravity from the stance limb. MF area plays an important role in dynamic balance maintenance when wearing high-heeled shoes. Gribble, P. A. (2003). The star excursion balance test as a measurement tool. Athletic Therapy Today 8(2): 46–47. Gribble, P. A., Hertel, J., Denegar, C. R. and Buckley, W. E. (2004). The effects of fatigue and chronic ankle instability on dynamic postural control. Journal of athletic training 39(4): 321.